In honour of the Queen I've done a jubilee special. I've celebrated by going to a carnival today, ate chips and got soaked wet through, I also wore a vibrant red wig, which matched Kate Middleton's suit!. But it was still nice to have a little celebration of the Queen. I came home and watch the pageant on tele with my family, and tried to warm up from getting so wet! It inspired me to do this post. Love these two dresses. Both simple and easy to wear with leggings or bare legs if the sun is in your favour. 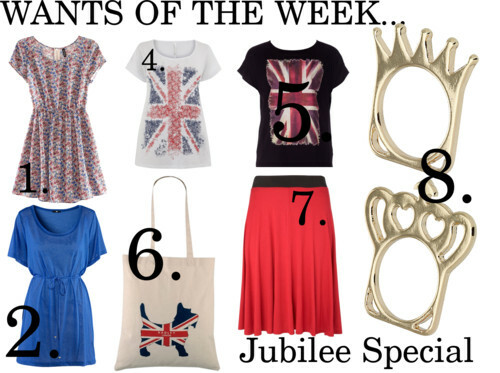 I love the floral one particularly and would have been great at a jubilee party this weekend if anyone went. Apparently I missed three out, my apologies! Motif tops are always popular, and the union Jack print will always be popular too. This white one is easy to wear with jeans and pumps. Another great motif top! This one could be worn on a night out with a black high waisted shirt and a leather jacket for a more British Rock Chick look. Always showing your support for the queen! A pretty bag, by a British company. Usually worn by the more mature woman, the queen would maybe use these bags actually! This shopper is a lot more casual and cute, with the typical Radley Icon. Kate was wearing something very similar this afternoon and I liked the all red look. Very royal indeed. I love midi skirts too, I think they flatter everyone and are always very pretty and feminine. I love these rings so much! They're so cute. And if you just want to subtly support the queen these are the way to go. They also come in Gold. Im off for some jubilee tea and cake. Enjoy your evening! !